Remember the Dracula movie with Bela Lugosi? If you looked into his eyes, he had hypnotic power. The lighting helped, too. Here, we look into the amber and see Linguamyrmex vladi. Scientists got a mite creative there, that last word vladi is based on Vlad Tepes, also known as Vlad Dracul and Vlad the Impaler. He had a nasty way of dealing with enemies, and became part of the inspiration for the Dracula novel and movies. Although nobody has any idea what the thing called a vampire hell ant actually ate, it had some interesting vertical trap jaw mandibles that are similar to vertical mandibles of ants living today. Did they grab another insect as prey, tip it like Junior's sippy cup and drink bug juice? Not all that likely, really. It may have used it to impale fresh fruit and drink that stuff down like a forerunner of the juice box. I reckon the "vampire hell ant" moniker is just a trifle hyperbolic. Gets your attention, though. Advocates of atoms-to-ant evolution assign the Burmese amber a date of 99 million years (it must have been on sale, it's usually 100 million years). Of course, dating is based on assumptions and presuppositions that fit the evolutionary narrative. There is evidence of the Master Engineer at work, but nothing resembling evolutionary evidence. That's because even ants were created, but Darwinists detest that fact. Locked in amber around the world are countless tiny flowers and small animals ranging from insects to lizards. Among these are hell ants—extinct ants with scythe-like jaws that moved upward in a vertical plane rather than horizontally. However fearsome these sound, you might well wonder how such an ant could eat. 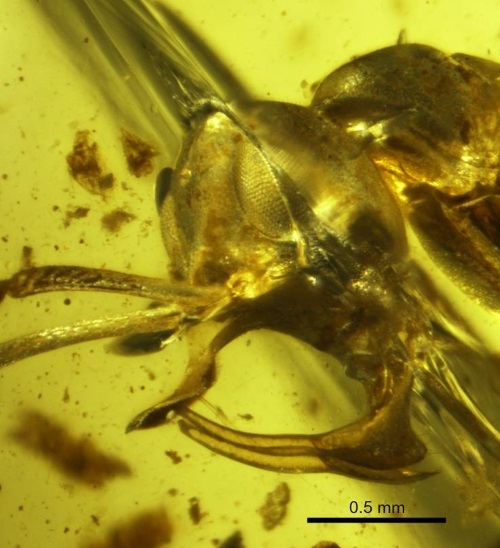 Detailed images of a newly discovered species of hell ant in Burmese amber may hold the answer. All living ants—and lots of fossilized ones—have pincer-like mandibles that converge in front of the face. Their mandibles serve many functions—cutting leaves, digging, carrying their young, and ripping off bits of food from either a plant or dead animal. Since no living ants have vertically oriented mandibles, scientists can’t be certain how hell ants used them, but now they have some good clues. To read the rest, click on "Vampire Hell Ants Preserved in Burmese Amber". BONUS! While we're talking about critters trapped in amber, you can learn about lizards that surprised evolutionists by showing no signs of evolution. Click on "‘Surprising’ lizards in amber". Creation and — Formula One Racing? Evolutionary Racism Against — Neanderthals?